I took binoculars and watched seals and heron and deer. (Black-tail deer were everywhere; too many, really. The island needs a couple of lynx or some other top predator.) But mainly I just zoned out and ate a lot. Actually we all ate a lot: we all love food, and cooking, and wine. We stayed up late by the fire, talking of writing, love, and life. 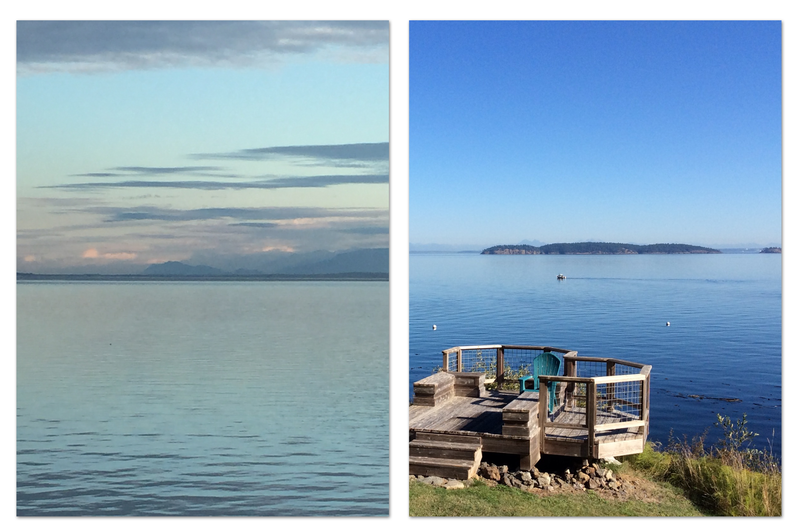 Orcas Island! I was just remarking to someone re the complex Puget Sound Land-Sea mix. Back to Google maps…. Wow. Almost to Canada! Never made it there. Heck, I never made it up to Vancouver…. You may recall, I was stationed at PSNSY (Bremerton Navy yards) back in the Vietnam era, and mostly, when I had time off, I was ready for (a) bright lights = Seattle or (b) some place I could drive to without taking the ferry. And, since most of my time there was in Winter, that meant rain shadow = Sequim. For a pretty damp value of “rain shadow”, to this SW-er…. Sounds like you two had fun, and recreated and stuff. Good food too, I hope? I still remember the Ginormous alder-smoked oysters @ the ferry docks in Seattle…. Sounds like a wonderful vacation! (I had one of my own recently, although it was quite different. :)) I’m glad you got a chance to rejuvenate, breathe, take in your setting, and simply enjoy existing in a beautiful here and now. May you take some of that energy and channel the strength you got from it into your future endeavors! @Brooks: I think you’d love it.